Damaged examples offered on Ebay for thousands of USDs. Note the identical overall appearance and the encrustations - from the same workshop ? These seals were offered by a German auction house. No. 783 is cut in the Mitanni "elaborate-style". The other seals imitate Neo-Assyrian scenes. Let me make clear: all these Neo-Assyrian seals here are perfectly genuine. The seals on the right depict scenes which are reversed to the seals on the left. 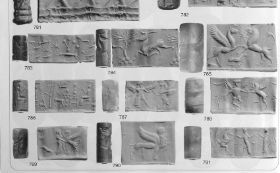 Sometimes a seal copied from a seal-impression indicates a fake but in antiquity many seals were made in workshops and copying from impressions was quite common.